Settle in to 3-star comfort with Square One shopping and business at your door at Novotel Toronto Mississauga Centre hotel. Natural light, functional modern decor and plenty of space in your room ensure you get the most out of your stay. A dip in the pool and a nourishing buffet breakfast are a great start for the day ahead at Novotel. 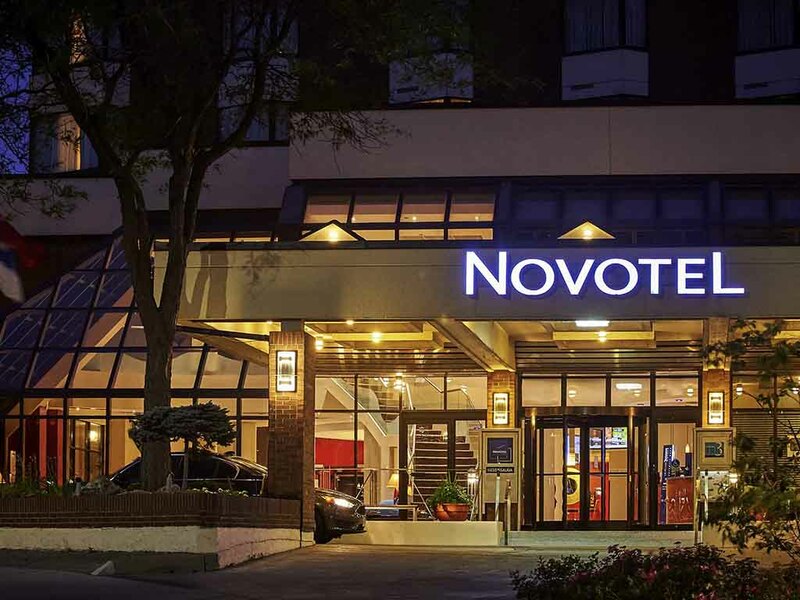 The hotel Novotel Toronto Mississauga is the ideal location to conduct business. The hotel is ideally situated near the centre of Toronto and next to the Pearson Airport. For business travellers, the hotel also offers free wireless internet and conference rooms. Other meeting spaces up to 13,000 sq. ft. are available. Novotel Trio, our contemporary restaurant and lounge, provides a suitable dining option for all travellers. Amenities include a high-tech fitness centre and indoor heated salt water pool. Raising Expectations in Downtown Mississauga - Trio Restaurant and Lounge - Serving up the best food and drink. Enjoy fresh ingredients and cocktails, amid inviting modern design, or dine outdoors on Trio's spacious seasonal patio. I stayed 2 nights, the pillows are amazing. I was impressed with the breakfast options. I was glad to not be sharing a room with anyone as the bathroom doors offered little privacy. They were cupboard style, two doors opening out. Staff had hardly any knowledge of our conference. Answered questions re meals incorrectly, went into my room and mixed up all of my paperwork whereas I could not present my info to coworkers. I left the do not disturb sign on door. Staff said there would be no refreshments within our event so I should pay 14.99 for breakfast. Then eat luch elsewhere because they were closed after breakfast til 5pm. I went to store and spent quit a bit in snacks food etc only to have refreshments and lunch at our conference through this hotel! Most could not understand and it was not a comfortable stay at all. Our room was missing a safe, we were told safes are on order and are scheduled for installation later this year. The room did not have enough drawer space for cloths, only was drawer in the room. The new renovated rooms were very nice and clean. The front staff were extremely friendly and helpful. The bar/restaurant staff were also fantastic, but the food, itself, has something to be desired. Most was overcooked and dry, or had no flavor. Love to see an updated menu. The hotel provided me a convenient stay. Staff at the front desk were warm and welcoming. Service in the dining room was great. While the room was quite neat, it had not been adequately cleaned following the previous client, as the bathroom still had a used facial cloth in the shower that had not been removed from the previous client. There were long dark strands of hair on the bed coverlets and in the bathroom on the floor and in the tub. It appeared that the floors had not be vacuumed thoroughly. Well my the first room had a hugh amount of hair in the toilet. And when they changed my room it wasn't any better. Most hotels would have upgraded or made great accommodations. Our stay was good. however i didn’t sleep well. you should consider putting a less fluffy pillow also on the bed. My stay was mediocre; the gym was under renovations, the whole lobby was under renovations, some rooms on my floor (14) were under renovations, the fire alarm went off at 6:00am on two of the days. It was not pleasing. I expected more. Razor blade in front walk way Woken by alarms and tacticle unit Threat assessment tecnhiques severely lacking. I usually stay at the Novotel. This time there were construction workers pretty much directly across from my room, yelling at each other using power tools etc. The worst was the knocking on my door with a do not disturb sign on it. Elevators require a room key to get to your floor and the one that most often came first was the most finicky. I had to hold my card key over the sensor multiple times and press the floor button over and over before it would accept my floor. Virtually no pressure in the bathroom taps and the water temperature is either too hot or ice cold, no warm setting. Toilet paper holder in a renovated room not secured to the wall. Starbucks construction in the lobby has been months in progress with no set date for opening. Disappointing. Check out takes long. Would like to see an express check out for business related stays where billing is made to a third party. Bedding - not sure I like how they sandwich a duvet between 2 flat sheets and just tuck it in. The duvet is not encased in a cover. Is it washed between uses or are the sheets simply changed? If so, guests are essentially sharing the same bedding because the flat sheets the duvet is folded into do not keep it protected. Same thing with the mattress cover. One flat sheet between it and you, so unless it is changed between every guest stay, that flat sheet becomes untucked and the mattress protector is completely exposed. Again, is that changed after every guest stay? Otherwise, it serves its purpose.